I’m deep in the throes of reading, reading, reading so much brilliant fiction from 2017, and making recommendations and notes in preparation for turning in my nominations for the Nebula Awards (including the Norton) and the Hugo Awards (including the Campbell). Along the way, I somehow failed until now to put up a post of which among my own fiction in 2017 I’d hope you might consider as you go through your own process. I’ll keep it simple, just one thing: My novella, Barry’s Deal. So here’s there thing. I’m uncomfortable with posts like this. While I like nominations as much as any author (and maybe more than many), and the occasional win too, I don’t want to campaign for them. That’s not my job. My job — and I’d argue, every author’s job — is to write the best fiction that I can, and moreover to write better fiction each year than I did the year before. Also to challenge myself, to try new things, to grow as an author, but yeah, all of that is in service to the main thing: writing the best fiction that I can. But the world isn’t that simple any more (and maybe it never was), and more and more every author also has to do publicity and marketing. Which is why, I believe, you see more and more posts like this, year after year. And now, here’s mine. In that light, I’m a bit more comfortable with it because, let me be clear, I’m not asking for your vote or even your nomination. I’m asking you to read my work. Anything beyond that, well, the work itself will either inspire your action or it won’t. That’s as it should be. Which brings us back to Barry’s Deal. Here’s the irony: while my novels have the backing and distribution of a major press, my shorter fiction continues to come out from a small press. Barry’s Deal, is only the fifth book from NobleFusion Press. It was published in late, in the second week of November. Both of these facts mean you’re unlikely to have heard about it, let alone seen a copy. And yet, I have the audacity to think that if you only read it you’ll like it quite a bit, so I’ve been persuaded to put up this post. 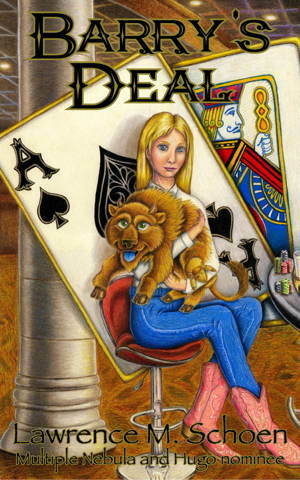 Barry’s Deal is the fourth novella in my ongoing series about the Amazing Conroy and Reggie, a stage hypnotist turned corporate CEO and his alien companion animal that can eat anything and farts oxygen. The novella stands on its own, though if you’ve read some of the other stories you’ll likely recognize returning characters. 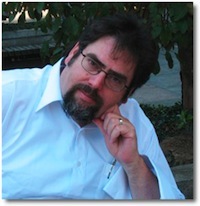 I’ve been writing about Conroy for 17 years. It appears that writing the more serious Barsk novels has taught me a thing or two, and the early reviews have described this novella as the best thing in the series so far. Anyway, I hope you’ll read it. And if you do, post a review and let me know what you thought. Thanks. This entry was posted on Saturday, January 13th, 2018 at 1:20 pm	and is filed under News. You can follow any comments to this entry through the RSS 2.0 feed. You can leave a response, or trackback from your own site.